I have played sports my whole life. I played varsity soccer in high school. In the middle of my junior year season, I took a hard tackle and injured my right ankle pretty bad. I couldn’t hardly walk the next day. It wasn’t even my first ankle injury, it wasn’t new to me. I tried to hide how bad it was and kept telling myself I could play. A couple days later we had a game against a rival and there was absolutely no way I was sitting out. So I played. Terribly. I was tentative. I was hesitating. I found myself feeling limited and in pain. Needless to say, I sat out most of the second half feeling downcast at how bad I played and frustrated that I couldn’t play my best even if I had wanted. Should I have been able to gut it out? Should I have been tougher? Maybe. But that was where I was at. Let me sum up the last 24 hours for Jay Cutler. He starts at quarterback for Chicago Bears in a huge playoff matchup against their rivals the Green Bay Packers for the right to go to the Super Bowl. He had a rough first half, struggled with his accuracy and was hit hard multiple times, dinging up his elbow and at some point getting his knee hammered. After halftime he comes out for one series and then is out injured for the rest of the game. Then the hate ensues. Multiple NFL players attack him via Twitter. Denver radio has been all over him. He and his teammates get asked multiple times if he was actually injured that badly. Why didn’t he stay in? Was he really injured? What a quitter. I have to admit, I was questioning his toughness a little as well. Jay Cutler does not seem to be well liked around the league. He’s been called “emo,” distant, self-absorbed, arrogant, and not a team player. He’s not very charismatic, does not interview well, and does not like attention, even when doing something nice for some sick kids. But is that a reason to question the guys’ heart? He plays starting quarterback for the NFL, one of only 32 such positions in the world. He ran the option for Vanderbilt in college, taking a regular beating in one of the tougher conferences in the nation, the SEC. This year, he’s been sacked 52 times, getting knocked out of one game with a concussion and fighting through multiple injuries to help carry a team to a 12-4 record. Doesn’t he deserve the benefit of the doubt? Turns out, he had a sprained MCL and teammates said his knee was actually wobbly just standing in the huddle! My Translation of Urlacher: Take the log out of your own eye! What right does anyone have to hammer Cutler outside of a reproof from his own teammates to his face? Cutler is not a personality, but an actual person. It’s very easy, as I struggled doing this as well, to take potshots at him from far away, judging his heart for that matter. I love how his teammates and coaches have defended him. Sure, he might be hard to get along with. Sure, it was tough loss. Sure, he didn’t play great before he got hurt. Maybe he didn’t seem to handle not being in the game very well and did not seem to be the greatest cheerleader. But would you respond differently? How do you know? This is national TV, a huge game, and he’s been injured and not able to continue. How positive would you be? I had to tell myself as the day went along: Just shut up about Cutler. I have no right to judge him as he’s been picked apart. For that matter, I acted the same way on a much much smaller stage with a much weaker injury with much lower stakes. Cutler has yet to defend himself. He shouldn’t have to. He probably won’t. But somebody should. As a Bronco fan, I did not like it when he demanded out of Denver. I have rooted against him the past two years. It’s not that fun, honestly. It’s amazing how easily we root for people to fail and then attack when they do. I don’t want to be that way. After the last 24 hours and all the harsh words directed his way, I will definitely have a hard time rooting against Cutler moving forward. Regardless of the person he shows himself to be. Thanks for reading and for your comment! Of course you can’t fully compare the two – I say that in my post! My point is that 99% of us don’t know his experience so we can’t simply hammer him, we might have responded the same way as he did. 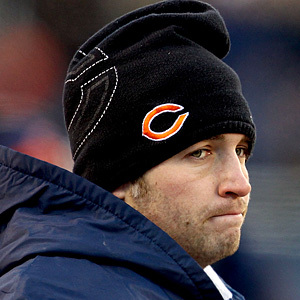 Let’s say Cutler’s heart really wasn’t in it, does that give me the excuse to criticize him and question him publicly?